Before her appointment as Associate Justice of the Court of Tax Appeals, Hon. Ma. 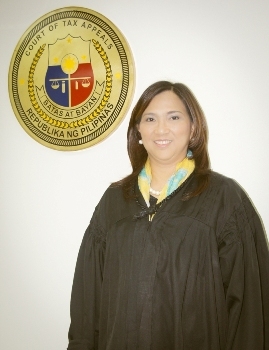 Belen Ringpis Liban was a Regional Trial Court Judge in Malolos and Quezon City for 17 years. She was a Solicitor at the Office of the Solicitor General, a Confidential Attorney at the Court of Appeals, a Legal Assistant at the Philippine National Construction Corporation, and a Legal Associate at the Puruganan, Ongkiko & Chato Law Offices. Justice Liban is a graduate of the University of the Philippines College of Law. She finished her AB Economics at the University of Santo Tomas and is a product of the public school system, having graduated from Project 6 Elementary School and Ramon Magsaysay (Cubao) High School. She was an active member both of the Philippine Women Judges Association and the Philippine Judges Association ("PJA"), where she last held the position of Senior Vice President. She was also the Secretary General, Vice President for External Affairs, and Director for Region 3 of PJA. She held the positions of Secretary and Auditor of the Philippine Women Judges Association, and was a Liaison Officer of the International Association of Women Judges. Justice Liban had attended various international and local conferences sponsored by the World Jurist Association and the PJA, and had participated in the Sta. Clara University Seminars on International Business Transactions. She was also a delegate at the Consultative Commission on Conference on the Law of the Sea. Justice Liban is married to Atty. Luisito V. Liban, a senior partner at Sycip Salazar Hernandez & Gatmaitan Law Offices, with whom she has five (5) children: Paolo Luis, Juan Rafael, Andrea Marie, Leo Fidel, and Jose Miguel. She is an active member of the Couples for Christ Foundation for Family and Life.